The cheese incident yesterday was not boding well for my cooking this week....the lingering odour when I got home from work today had me wishing we had one of those ionizing air filters to rid the house of all vestiges and memories of that putrified dairy product. 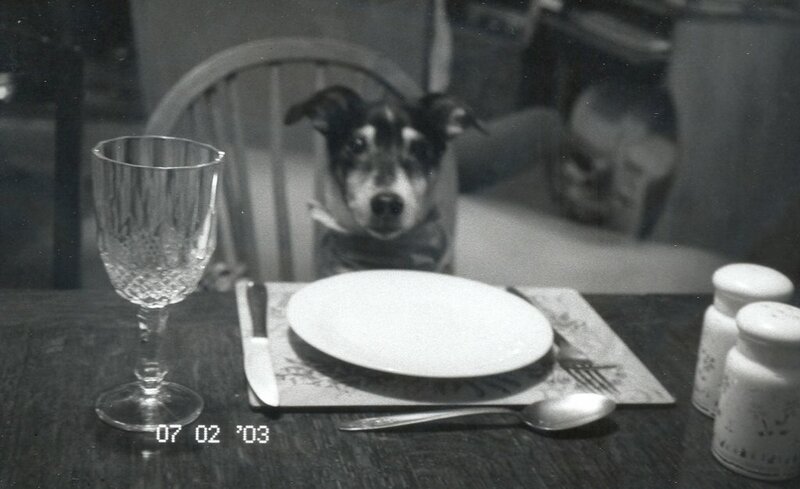 But today brought new food and new scents to the kitchen. Lovely, sweet, veggie scents. Soupy yummy scents. The taste and colour of spring, providing a bright spot in a dim, dreary winter. Is there anything more cozy-smelling than soup bubbling away on the stove-top? So I made squash pepper soup with smoked paprika. And while I was in the midst of making it, I decided that parsley leaves (initial garnish idea) were boring, and that persillade was the thing to top this soup. 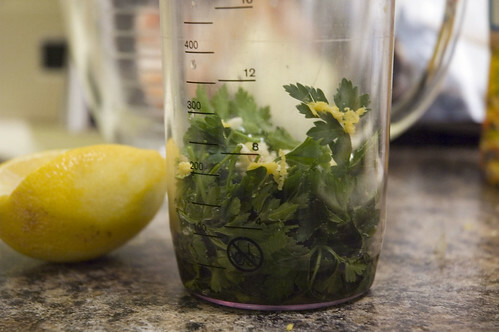 Persillade is kind of like a French version of pesto - fresh herbs, garlic, lemon and salt. Very simple, but a little blast of fresh flavour and a flash of colour. Also, the initial recipe called for pumpkin seeds (that my discount grocery store didn't have) so I used wee little sunflower seeds to make mine look pretty. I served this with my classic green salad (using baby arugula and a red wine vinaigrette) and a few little cherry tomatoes. Yum. Hubs says two thumbs up. I concur. 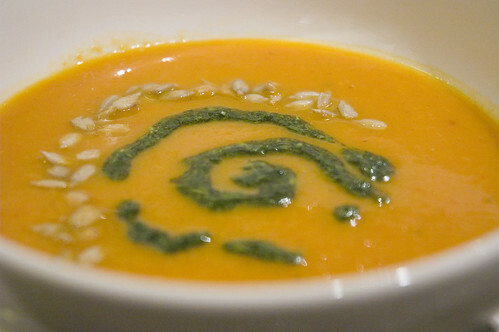 If you like soup, you'll love this. The bonus is that it offered me a chance to use a little bit more of the fabulous smoked paprika I bought a couple of weeks ago. 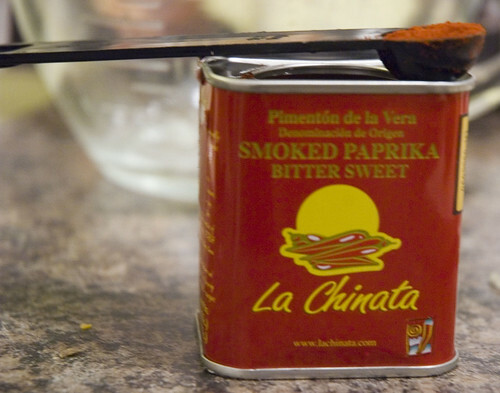 You should all throw out your regular paprika right now. Toss it! Find yourself some good spanish smoked stuff and you'll never look back. Ever. Again. Yummmmmmmmmmmmmmmmmy. 1. In a large pot, heat olive oil over medium heat. 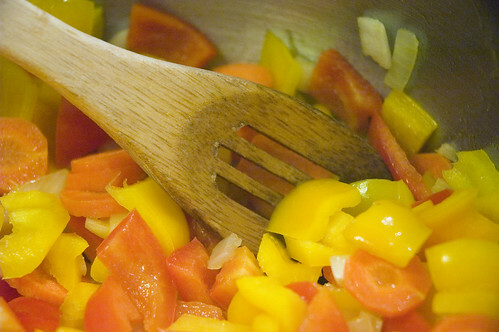 Add peppers, carrot and onion. Sauté for about 10 minutes, until the veggies are softened and *just* starting to fuse to the pan. 2. Add garlic and smoked paprika and stir to combine. 4. Using an immersion blender, purée the softened veggies until relatively smooth. Add the squash and lemon juice and purée a little more. I like my soups relatively thick, so this was a perfect texture for me. If you like your soup thinner, simply add a little more broth or water and blend a little more. Yummy! Heat through. To serve, top with persillade and a few sunflower seeds. This will warm you up on a winter night fo sho. This dinner totally redeems yesterday's mess. I can't wait for soupy goodness for lunch tomorrow. :) Provided, of course, it doesn't explode all over my briefcase before I get to work...stay tuned for indian-mexican fusion tomorrow....chipotle....tandoori...shall the twain ever meet? Looks delicious! From start to finish, how long did it take to cook? I love the Persilade idea! Genius!